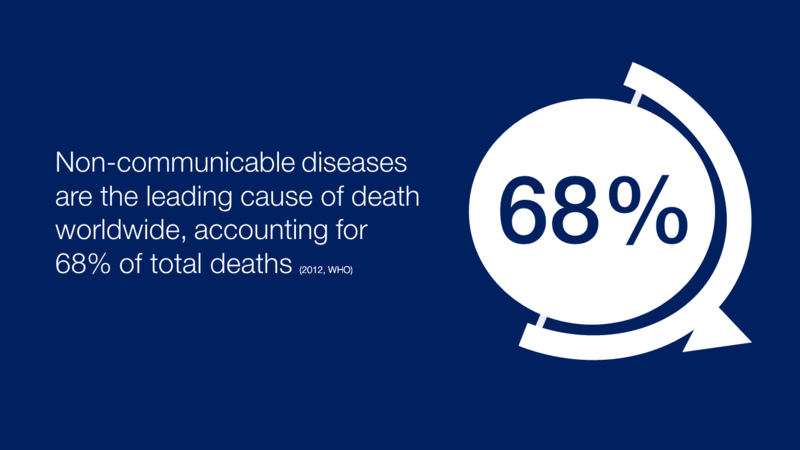 Non-communicable diseases (NCDs) – conditions that are not caused by an acute infection – are the leading cause of death worldwide, accounting for 68% of total deaths in 2012. They are responsible for significant premature disability, morbidity and mortality, and are major contributors to social inequity and poverty. In high-income countries such as the UK, NCDs and chronic disability are responsible for a much greater proportion of the burden of disease than infectious diseases, and much of our work at PHE is aimed at tackling related risk factors such as tobacco use, physical activity and high salt intake. In low- and middle- income countries, while the burden of infectious diseases is in many cases decreasing, the prevalence of NCDs is rising as populations age rapidly, and lifestyle changes due to social and economic globalisation increase exposure to related risk factors. For example, diabetes has become a growing problem in developing countries—an increase driven largely by a rise in obesity. In fact, more than 80% of the estimated 1.5 million global diabetes deaths in 2012 occurred in low- and middle-income countries. In countries where health care is not free, such as Kenya, diabetes and other NCDs are not just placing a growing strain on the national health care system, but also on families who struggle to pay for treatment. Most NCDs and their risk factors are preventable. As well as working to avoid preventable illness and death and in England, we have a responsibility at PHE to contribute to global efforts to reduce the burden of NCDs around the world. This blog will explain why this is so important and highlight some key areas for action. Morbidity and mortality from NCDs predicted to rise by over 50% in low and middle-income countries by 2030. This is creating a double burden of disease, as the prevalence of risk factors for chronic diseases such as diabetes, heart diseases and cancers increases in countries that are still grappling with infectious diseases such as AIDS and malaria. This double burden threatens to overwhelm the capacity of these countries and poses difficult health and developmental challenges. Not only are NCDs a leading cause of morbidity and preventable death at home and abroad, they are also a growing threat to global security. We depend on the economic development, stability and security of the rest of the world for our own health and development. NCDs and their risk factors are a cause and consequence of poverty and inequity, contributing to instability in populations and undermining public health and social and economic development across the globe. The common risk factors and wider determinants associated with NCDs transcend national boundaries. As the global burden of NCDs grows, governments have recognised that a unified global approach is needed to protect national populations. In an increasingly globalised world, PHE has a responsibility to share its knowledge and expertise in addressing NCDs and to learn from others. In doing so, we support the principles that underpin the UK Government’s approach to global health. We also form part of a global movement to combat NCDs: the WHO Global NCD Action Plan 2013-2020 outlines nine voluntary global targets, while the Sustainable Development Goals call for a reduction in premature mortality from NCDs by one third by 2030, through prevention and treatment and the promotion of mental health and wellbeing. We are already seeing an increasing number of opportunities for collaboration and requests from other countries for support and expertise. For example, we are working with Mexico on teenage pregnancy and obesity, and next year we will develop collaborative working with China on sugar, salt and HIV prevention. We now want to build on our existing international engagement with a more strategic approach to international and global health activity on NCDs. We are currently developing a plan setting out where we will focus our efforts over the next five years and will develop this further in conjunction with other government agencies, NGOs, health professionals and the academic community, to identify ways that we can work in an integrated way. PHE, working as part of the international community, can make an important contribution to tackling NCDs and their determinants globally. Our work at home will also benefit significantly from international partnerships, which can enable us to learn from best practice around the world and draw on the widest evidence base. As public health professionals, we can all help to promote this important global agenda and learn from new and exciting approaches being developed by our international colleagues.